Anna Nagar finally has a mini food truck and we dropped by to check out its affordable, quick meals on wheels. 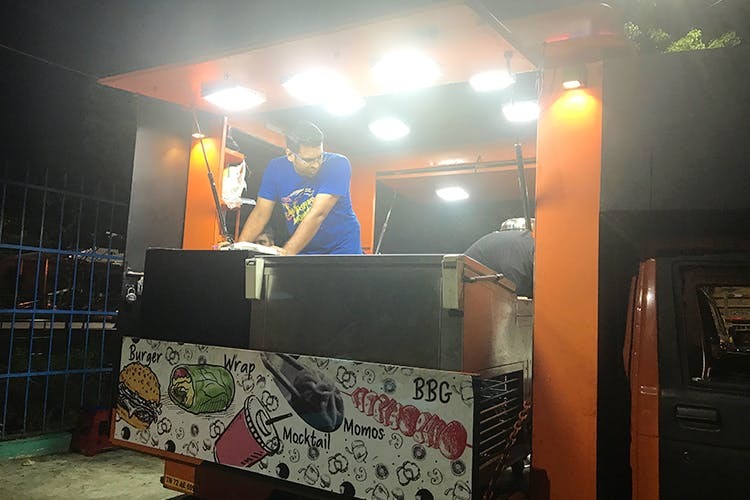 Located right opposite the metro in Shenoy Nagar, near Pulla Avenue, Moto Wrap is a catering van that operates every evening and churns out pretty budget-friendly starters and a few other dishes. We made a pit stop at the truck recently and here’s everything we liked! To begin with, the most recommended dish from the truck are their rolls. Their Chicken Kheema and Paneer Wraps are just INR 99. They are filling and we particularly liked their Haryali and Tandoori (non-veg) wraps. They also serve momos for INR 79. Have a ravenous appetite? Fear not! They even serve BBQs and burgers. We enjoyed digging into their hot-hot Prawn BBQ and Chicken Wings grilled right outside the truck. At INR 99, these are perfect if you’re hungry and on a budget! Also try out their Chicken Deluxe Burger and Tandoori Chicken Burger. We like how they’re available in two sizes, the mini and mini max, so you can pick the size suited for your appetite. We think that the truck is best for takeaway food. But you could also sit down around the mini van in their colourful small stools and munch on quick, budget food that’s nice and hot, like we did.